- 殘編 (Tanya Hsu) on 一月 27, 2019. 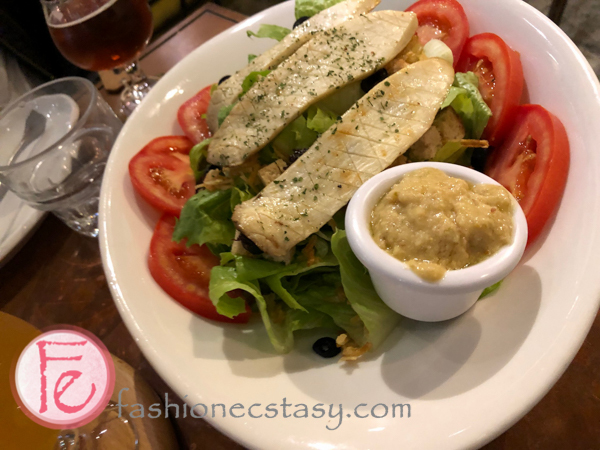 Vegetarian restaurants in Taipei are not hard to find, but vegan restaurants that have gained popularity in Europe and North America in recent years are not easy to find either. URBN Culture is a vegan restaurant/bar that has been on my radar for a long time. I finally had the chance to try it out with a friend from the States. Our server at URBN Culture speaks fluent English and introduces the menu in full-on English without any troubles. The restaurant reminds me of the Top English-friendly Shops I was hired to review by the Tainan City Government for the past two years. The menus are available in both Chinese and English, foreigners and tourists friendly. The menu uses nutrition-packed vegan superfood like Kale, tempeh, Quinoa, and chickpeas as ingredients. Vegetarians are categorized into many different types: Lacto-vegetarians, Lacto-Ovo vegetarians, ovo-vegetarians, and many more. Each of them follows different dietary restrictions. Among them all, veganism is the strictest. Veganism adopts a plant-based diet. Besides milk, eggs and their products, vegans do not eat animal-derived ingredients such as honey, or products that add animal products to filter impurities. In addition to health reasons, vegans maintain a strict diet to protect the environment and protect animals. Many beers add fish finings to the production process to filter impurities. The beers served at URBN Culture are all vegan unless noted otherwise on the menu. They truly respect their consumer’s choices and lifestyle. The first floor is a bar with high-table bar seats and regular low table seats. The wall is painted with colorful graffiti and street art with great “attitude.” There is a patio area for sunny days. We spoke English when we walked in, so our server hands us the English menu naturally, but they do also have a Chinese menu. We merely came here to get a taste of veganism, so we didn’t order much. 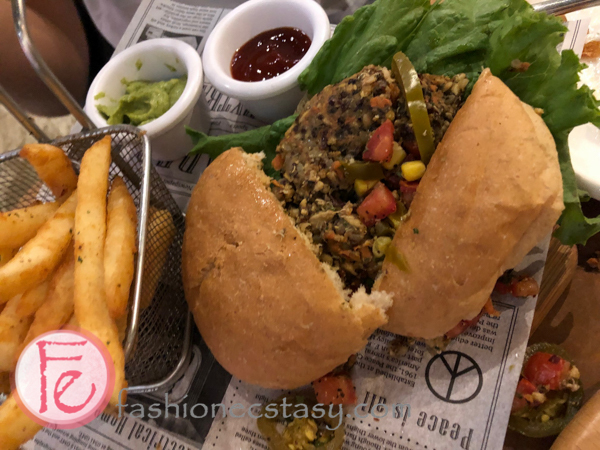 We ordered the Vegan Caesar Salad ($320), the Fried Wonton ($180), and the Vegan Homemade Burger ($340) with the choice of Spicy Mexican with guacamole and Jalapeno. Mixed lettuce is covered with a layer of grilled king oyster mushroom slices Potato shreds, sliced tomatoes, and black olives fill the bowl. The most unique thing is the “Chickpea dressing homemade by URBN Culture. It retains its original flavor and tastes healthy and provides high-quality protein. Having Vegan makes us want to order something with high-calories, so we try the Fried Wonton. An option of with or without cheese is available, we try it with. This is the crispy wonton version of Ravioli, It is stuffed with spinach and Ricotta cheese and spinach filling. It is served with Thai chutney. the skin is fried to perfect crispy and goes well with the sweet and sour sauce. URBN Culture‘s homemade vegan burgers are made with high-nutrition superfood ingredients such as tempe, black beans, flax, brown rice, quinoa and oatmeal. Their whole-plant burger is even more nutritious than a typical 5oz meat burger. The taste is no inferior either.I’m not vegetarian, but URBN Culture‘s vegan materials can make such delicious meals and make you feel good even after a big vegan meal!